Prominent entrepreneurs who play chess are: Peter Thiel, co-founder of Paypal along with Microsoft founders Bill Gates and Paul Allen. Stepping Stone School is proud to introduce the traditional, yet revolutionary game of chess to its advanced pre-k and school-age masterminds! These students are learning about the history of the game as well as how the pieces move and strategies for winning. The classes will also include tournaments to allow the students to practice their new skills. Several studies have shown that children who play chess improve their analytical and critical thinking skills as well as visualization abilities. 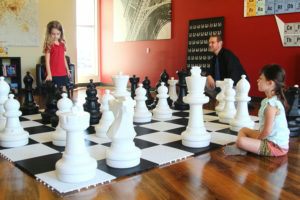 Chess has also been shown to boost children’s math, reading and verbal skills, but the benefits go far beyond academic. Aiding in the growth of certain areas in the brain & mind.